PBA Rookies of Class 2017 - How are they so far? PBA's 2017 - 18 season is almost a month old but has already given us an idea on how the rookie class of 2017 fares with their kuyas in the big league. Though it can be argued that it still too early to rank them, but I believe that for those who are following our rookies (like me) it's very interesting to know how are they doing now. Take a look below at how the celebrated young guns are performing. And see how they impact their teams at this time of their young careers. I am confident that I'd get minimal to none at all opposition - when I say that Jeron and Kiefer leading the scoring pack is not surprising at all. With the top over all pick Christian Standhardinger still at ABL, these two young guns can go head to head for a scoring duel. Kief though may have a different thought after his off night game against the Fuel Masters where he was held only with 8 points after tallying double digit baskets on his first 2 games. 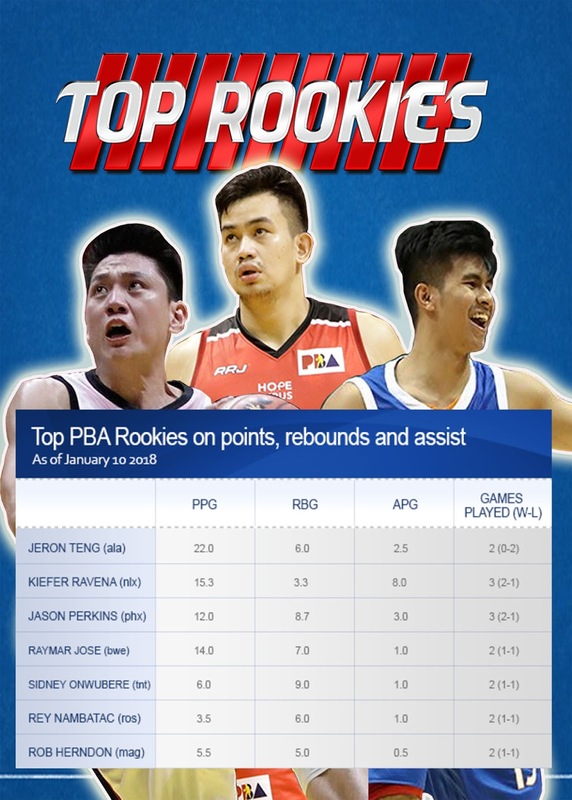 Jeron Teng on the other hand would definitely going to trade personal accolades just to get a W. Despite topping this initial (and unofficial) rookie ranking the younger Teng has yet to experience a victory in the pro league. His time will come, maybe on their next game. Who knows? UPDATE: 2018 PBA All Star Games Logo Making Contest - A Case of Plagiarism? 2018 PBA All Star Game - Vote Now!